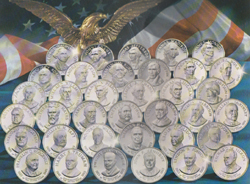 The 1974 Medallic Yearbook Medals Collection (Franklin Mint, 1974) Current Market Value. 45mm. Complete set of 12 medals. Each medal in this annual series of 12 is designed to capture the impact and the most important news events to have occurred in the calendar month for which it is issued.